Measuring viability and necrosis are an important component of pharmaceutical and academic research. Identifying viable cells in harvested primary samples and in tissue cultured cells provides researchers the ability to determine the condition of their samples. Furthermore, the ability to quickly determine the cytotoxic effect of chemical compounds on cancer cells allows researchers to efficiently identify potential drug candidates for further development in the pharmaceutical discovery pipeline. Necrosis is most often characterized by irreversible cellular damage which includes but not limited to: cytoplasmic swelling, permanent cell membrane damage, organelle breakdown, and eventually the release of cellular contents into the surrounding medium. In non-viable cells the loss of cellular membrane integrity allows for membrane exclusion dyes such as propidium iodide (PI), ethidium bromide (EB), 7AAD, SYTOX green/red, and others to freely diffuse into the cell and bind to its DNA. Because these dyes only enter cells with compromised cell membranes, early apoptotic and healthy cells will not be stained, while dead or dying cells will be stained. The emitted fluorescent signal is captured by the Cellometer and an image is generated. Both brightfield and fluorescent images are captured and enumerated by the Cellometer. 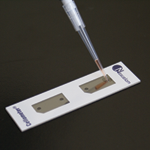 With the Cellometer Vision, just 20 µl of sample is added to the Cellometer Counting Chamber. 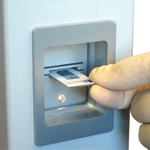 Imaging and analysis of the samples is completed in less than 30 seconds. 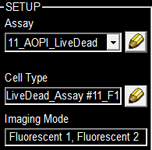 Bright field and fluorescent cell images can be viewed to check cell morphology and verify cell counting. Total cell count, concentration, and mean diameter are automatically displayed. Jurkat cells were exposed to various temperatures for 20 minutes and stained with propidium iodide. At 37 °C, the standard incubation temperature, cells remained healthy and very few necrotic cells were detected. The viability of the sample was determined to be 93.8 %. As the temperature was increased the percent of PI positive cells increased from 6.2% at 37 °C to 89.8% at 60 °C.